Last year, 12 Years A Slave took the world by storm with its true life account Solomon Northrup and captured the Best Picture Oscar. Around the same time, another true account film was released about yet another freed slave. However, this young lady was raised on equal footing as her Caucasian contemporaries, educated as an equal and became an heiress in early 1700’s England. Needless to say, such a thing was unheard of then and it suffices to say that even as I write this it was shocking to watch. However, it was refreshing for once to see a film with slavery as the subject where the “N” word was never used, no violence and no constant dispicable behavior of whites towards blacks. 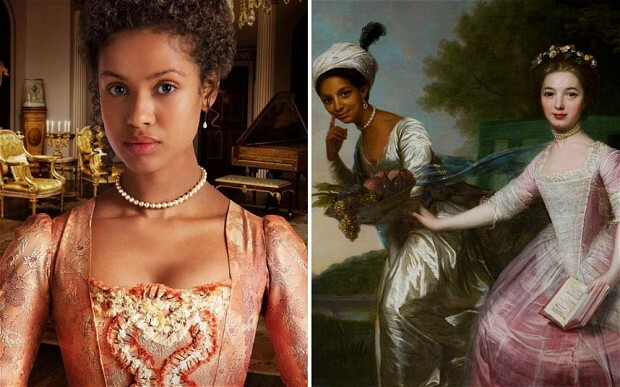 “Belle” is the story of Dido Elizabeth Belle, a young mulatto girl raised by her uncle Lord Mansfield. Lord Mansfield, while presiding as Chief Justice, ruled in a landmark trial regarding the Zong Massacre (a slaveship in which the slaves were regarded as property and drowned). It is believed that Lord Mansfield’s ruling was one of the key trials that ultimately led to the abolishment of slavery. Although, this subject is at the heart of “Belle”, we also watch a love story unfold and once again have a front row seat to the behavior of others when they are threatened by the color of another’s skin. Dido Elizabeth Belle and her husband John Davinier had three children and the last living relative was a great-great grandson who died 1975 in South Africa. The details of his death and Dido’s are unknown, but her legacy lives on in every woman…no matter what color who has the intelligence and tenacity to stand up for what she believes is right and fair. As it has proven in history time and time again, this is the only way that change and growth can prosper. I loved this film and am saddened to know that it almost without a doubt will not be lauded in the same way “12 Years A Slave” was…even though “Belle” and its director/writer Amma Asante deserve that and so much more. Gugu Mbatha-Raw was exceptional as Dido Elizabeth Belle. Her range and emotional depth as an actress is absolutely mind-blowing. Do yourselves a favor and prove me wrong! See “Belle”…tell your friends and shout it from the mountaintop! It deserves to be seen and promoted by word of mouth. Don’t let the spirit of Dido die…keep it moving!! !